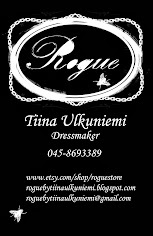 Rogue by Tiina Ulkuniemi mini collection is going to be shown at Tampere Tapahtumien yö. Ateljeekatu is having a fashion show at Kehräsaari. Gringos locos has agreed to borrow their terrace to be our stage. The show will be 7.8.2014. I not yet sure what time, but I'm guessing around 18.00. Here's a little peek what will be shown on my mini collection. I'm telling you it is horrible to try something on in this heat that is made out of fake leather and is floor length. And trying not to pin yourself to the dress in the process.